Download this App to read tafseer of Quran Karim in iPhone and iPad translated in English Language. Now you can study Ibn e Kathir tafseer with bookmark and text customization options. 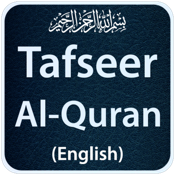 • Complete Book of Tafseer ul Quran in English Language (Only In Full Version). • Can send or share any part of text on social website ie facebook twitter or can mail to your friends. * Upgrade to Full version for Maximum Data & Ads Free Version.